All throughout the history of the Black experience in America, various Black leaders have been dubbed or identified as “Black Moses.” Harriett Tubman was considered a “Black Moses”. Marcus Garvey was considered a “Black Moses” as well as many other strong courageous voices among us who spoke truth to power and carried the burdens of the Black community seemingly on their shoulders. The “Black Moses” moniker and it being appended to strong Black leaders originally arose out of our enslaved African ancestors being on plantations throughout America and their being instructed in religion via their masters or any of their fellow slaves whom their masters “approved of” and appointed as preachers. And even though the religious instruction of the slaves was intended to be a placebo or pacifier; the natural spirituality of Black people mixed with the yearning for freedom and liberation merged together to produce a robust religious expression that today is the vibrant and soulful Black church that we all know and love. That a Black leader be designated as Black Moses is then appropriate when we consider that Moses’ ministry and career, as it is depicted in the Bible’s Old Testament, is characterized by certain strong themes that include liberation, law and punishment for slave masters. But the Bible reserves the most important depictions and narratives for a figure who appears many years after Moses. That man is Jesus. It stands to reason therefore that if the suffering of Black people in America gave to birth to leaders who fit the description of Moses; one day our suffering would give birth to leaders who fit the description of Jesus. From my study both the Most Honorable Elijah Muhammad and the Honorable Minister Louis Farrakhan fit the description of Jesus. One only need examine their teachings, their beneficial impact on Black people and their suffering as a result of the truth that they have taught to understand why I have drawn this conclusion. Currently I am fascinated at how the most recent chapter in Minister Farrakhan’s controversy with Jewish leaders supports my conclusions. Jesus as he is depicted in the Bible’s New Testament has a ministry that is similarly framed by certain strong themes just like that of Moses. Jesus ministry includes the same themes as that of Moses and the prophets before him; however the strongest theme in Jesus ministry is love. Jesus saw the flaw in how religion had been practiced by the people of his day, particularly the tendency for adherents to obey the law of God because they feared the punishment that would result if they did not obey. Jesus’ preaching emphasizes that the love of God should be the believers’ motivation for obedience and submission to His divine will and commands. Jesus’ went about his work and ministry demonstrating the transformative power of love for God and his fellow man and woman. Jesus’ love of God and righteousness made him bold and courageous. In Jesus’ life and work we see how “love removes fear.” And the New Testament records that his ministry became a problem for Jewish leaders whose corrupt practices enslaved the poor; Jesus challenged them and they opposed him. So the Jesus model of leadership, among Black people in America, is identified when we see Black leaders facing the powerful opposition of America’s Jewish leaders. The Jesus model is recognized in loving and kind leadership; the Jesus styled leader is gentle and merciful in his interactions with the poor; yet he is simultaneously a man known for a bold and courageous ministry that speaks truth to power. And these are characteristics of the life and work of the Hon. Min. Louis Farrakhan. If you don’t agree, then permit me to direct you to certain observations that align with my conclusion. A survey of the Jesus narratives of the New Testament powerfully exposes important parallels in Jesus’ Jewish controversy and Minister Farrakhan’s Jewish controversy. Mr. Obama now will have to evaluate whether or not he wants to once again repudiate Minister Farrakhan. He will have to evaluate whether or not he can stand against what lies behind Greenblatt’s words, which is clear to me is a threat . Over the years the demand from groups like the ADL that a famous person “repudiate Farrakhan” is a form of intimidation and is often a threat. 1964: Henry Schwarzchild, an official in the publications department, quits the ADL in protest against the League’s spying on Rev. Martin Luther King, Jr. on behalf of the FBI. On April 28, 1993, San Francisco Weekly, a Bay Area newspaper, provided the following account about the ADL collusion with J. Edgar Hoover against the civil rights leader: “ADL was spying on Martin Luther King and passing on the information to J. Edgar Hoover, a former ADL employee said. ‘It was common and casually accepted knowledge,’ said Henry Schwarzchild, who ‘Worked in the publications department of the ADL between 1962 and 1964. “Schwarzchild, now with the American Civil Liberties Union in New York, said the ADL spied on King meetings because they were afraid that if the famed civil rights leader stirred a white backlash against blacks in the South, it would encompass Jews as well. ‘They thought King was sort of a loose cannon,’ he said. ‘He was, a Baptist preacher and nobody could be quite sure what he would do next. The ADL was very anxious about having an unguided missile out there. The Jewish community was smaD but very well settled in the Deep South. Freeman’s coded language of retaliation for those who refuse repudiation of the Minister is the modern equivalent of what we read of in the New Testament book of John. The book of John reveals to us that not only had the Jewish leaders planned to crucify Jesus; they had also planned to crucify Lazarus. From the perspective of the Jewish leaders who opposed Jesus, Lazarus had produced the “legitimation” of Jesus and was causing many others to believe in Jesus. In the modern era persons such as Rev. Jesse L. Jackson Sr.; Actor Bruce Willis; Mayor Ed Rendell; Congressman Keith Ellison; Congressman John Conyers; and Presidential candidate Barack H. Obama are just a few famous individuals who Jewish leaders have demanded that they repudiate the Honorable Minister Louis Farrakhan. For many years the consensus in the Black community regarding the absence of comedian Arsenio Hall from being an A-list celebrity is because he ended his wildly famous Arsenio Hall Show with a highly watched interview with the Honorable Minister Louis Farrakhan. The plot to kill Lazarus showed up again as a strategy of the wicked in 2015 during Minister Farrakhan’s organizing and promotion of the Justice or Else 2015 gathering in Washington D.C.
As the Minister traveled the country he held meetings with political, civic and religious leaders. And one of the most significant features of the Minister’s organizing was his meetings with local artists, musicians and cultural figures. Many of the top tier entertainers and hip-hop artists flocked to the Minister’s messages and posed for historic photos with the Minister and his staff. This angered the ADL. They devoted a page on the ADL website to criticize and condemn the rappers for their posing for photos with Minister Farrakhan and for helping the Minister promote the Justice or Else event. In an article written by the Final Call newspaper’s Ashahed Muhammad he discusses how the ADL’s condemnation of the artists was followed by several of the artists being arrested and experiencing various legal troubles. – Officials in Georgia said rapper Rick Ross, whose real name is William Roberts, was released July 6 from a Fayette County jail after posting $2 million in bail on charges of kidnapping, aggravated assault and aggravated battery. Arrest records say Roberts is accused of forcing a man into an area at his metro Atlanta mansion June 7 and beating him with a handgun, leaving him with an injured jaw. He was arrested on June 24, less than 48 hours after he met with Min. Farrakhan. It was the same day of the official announcement of the 20th Anniversary of the Million Man March at Metropolitan AME church in Washington, D.C. In fact, according to The Nation of Islam’s social media director Jesse Muhammad, #JusticeOrElse was trending on Twitter that entire day and the only thing trending higher, was news of the rapper’s arrest. He had also been arrested a few weeks prior after being stopped by police for a window tinting violation and marijuana possession. At that time, he not only made bail, but he reportedly bailed out others he befriended during his brief stint behind bars. – The West Coast rapper known as The Game has been charged with hitting an off-duty Los Angeles police officer during an altercation at basketball game earlier in March. The Game, whose real name is Jayceon Terrell Taylor, met with Min. Farrakhan June 17, but even before that recent meeting and subsequent interview with The Final Call in which he pledged support for the #JusticeOrElse movement, he released the single “Don’t Shoot” in the summer of 2014 as a tribute to Michael Brown Jr., the teenager killed in Ferguson, Missouri. Coincidentally, the song featured Rick Ross, 2 Chainz and Diddy among others. The song mentions other Black men killed such as Emmett Till, Ezell Ford, Trayvon Martin, and Sean Bell. Facing charges of one felony count of making criminal threats and one count of misdemeanor assault and battery, The Game pleaded not guilty during his most recent court appearance June 29. He is free on $50,000 bail and faces up to three years in prison if convicted. His next court date is July 30. – Reports have surfaced that the rapper 2 Chainz, whose real name is Tauheed Epps, is being sued for $5 million over comments he made in a video recorded and posted containing back stage footage at a concert in Charlotte, North Carolina way back in March of 2014. The woman suing him, Christine Chisolm, claims he referred to her using a derogatory term. 2 Chainz met with Min. Farrakhan during the historic meeting with Hip Hop giants at Tree Studios just outside of Atlanta June 21. On June 28 at the BET Awards, 2 Chainz was asked about his recent meeting with the Minister. He said he was happy to be in the Minister’s presence and “big things are on the way for the community,” he added. – Sean Combs, the Hip Hop mogul known as Diddy, was in the news after being arrested June 22 charged with three counts of assault with a deadly weapon, battery, and making terrorist threats. Mr. Combs allegedly assaulted one of the coaches of the UCLA college football team. His son Justin is a defensive back for the team. No injuries were reported resulting from the alleged attack, and reports have surfaced that the coach was bullying young Combs. – Reportedly, a member of rapper Young Thug’s road team was arrested after being accused of shooting at rapper Lil Wayne’s caravan early in April of this year. No one was injured. Young Thug, whose real name is Jeffery L. Williams, has not been directly implicated in the shooting, however the feud between the two rival camps is a hot topic in social media and on Hip Hop related news sites. The ADL also seems to be very interested in Kanye West, who came under sharp criticism in 2013 after he publicly opined, “Black peo­ple don’t have the same level of con­nec­tions as Jew­ish peo­ple.” After speaking with Min. Farrakhan and receiving counsel and guidance, Kanye West refused to bow to Jewish power and refused to apologize for his comments. He was present for the Minister’s recent message in Los Angeles, and has also coined a new honorific title for the Minister— “Sensei,” meaning a highly respected master teacher. Although not mentioned by the ADL, in a 2014 interview Young Jeezy, whose real name is Jay Wayne Jenkins, said once he began speaking out about issues like what was happening in Ferguson, “things started getting a little funny. When I really just started speaking my mind about it, a lot of strange things started to happen around me.” He also has spoken publicly about his love and admiration for Min. Farrakhan. The Minister’s strength and widespread appeal is the result of his anointing. 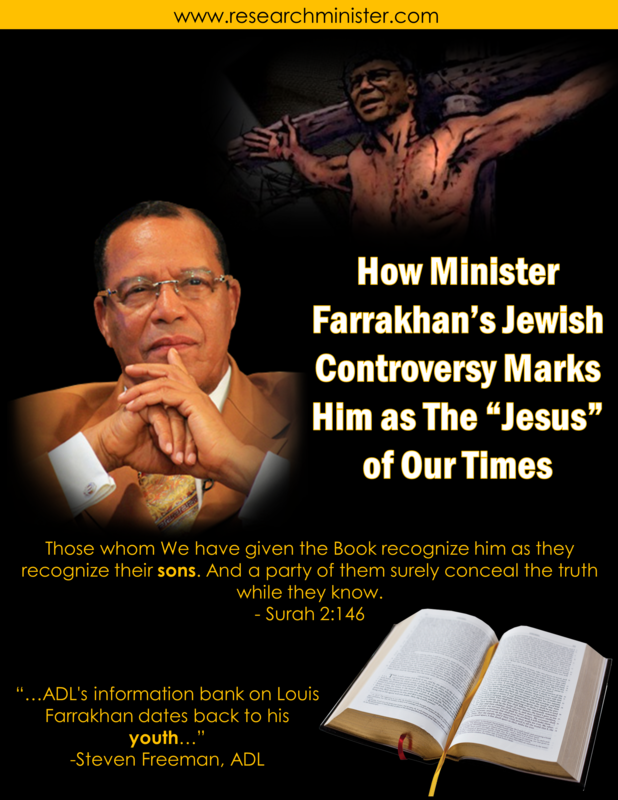 So just as the Jewish leaders in the New Testament falsely attributed Jesus’ fame to Lazarus; the modern Jewish leaders falsely attribute Minister Farrakhan’s “legitimation” to Black celebrities and politicians. Truth be told, it is not Minister Farrakhan who is the net beneficiary of his interaction with famous folk. It is quite the opposite. The Minister gives to them a favorable place within the divine scheme of things. 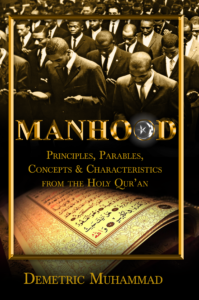 He helps them to have a higher profile secular society, but more importantly these men and women through a positive association with Minister Farrakhan earn for themselves and their children the favor and protection of Allah(God). Just reflect on former Washington, D.C. Mayor Marion Barry. His triumphant return to public live and political victory flowed from his positive association with the Honorable Minister Louis Farrakhan. Minister Farrakhan not only defended Mayor Barry as the target of a multi-million-dollar political take-down. He also, pastored Mayor Barry and encouraged his heart and ministered to his soul so that he might overcome the embarrassment and feelings of self-loathing that followed public disgrace. Who then among us will defend Minister Farrakhan? Or will we once again allow a good man to be crucified ?